The UNO Men’s Hockey team traveled up to Notre Dame, Indiana, where they split a twogame series against the eighthranked Fighting Irish on Oct. 26 and 27. On Thursday, just 15 seconds after the first puck drop, the Mavericks jumped out to an early 1-0 lead off the stick of senior David Pope, who was assisted by Jordan Klehr. The first goal came quickly and easily but the Mavs wouldn’t let up. About five minutes later, UNO’s Jake Randolph scored a goal of his own and added to UNO’s lead making it 2-0. The rest of the first period was filled with a lot of back-and-forth action but both teams got over 10 shots off in the first period but the score remained 2-0 in favor of the Mavs. The second period was a bit more competitive for fans. UNO’s Steven Spinner got in on the fun with a goal just 54 seconds into the period. The Mavs took a 3-0 lead early in the second period and looked as if they were about to blow out the Fighting Irish at their own rink. Notre Dame fought back though, and Bobby Nardella managed to sneak one through the defense just three minutes later with 16 minutes remaining in the period. The score was now 3-1 and stayed that way for several minutes before UNO’s Pope scored again. Assisted by Randolph, Pope squeezed the puck into the back of the net to propel the Mavs to a 4-1 lead. Zach Jordan then reinforced the Mavs’ lead, scoring yet another goal about 50 seconds later and expanding the lead to 5-1. Despite being down four goals, Notre Dame had some quick answers. Cal Burke and Andrew Peeke both scored for the Fighting Irish before the end of the second period, making the score a manageable 5-3 before the start of the third. A little over one minute into the final period, Notre Dame found themselves in a power play situation where they came away with a nerve-wracking goal from Jordan Gross to close the gap and make the score 5-4. The game would go on for another 18 nail-biting minutes before UNO’s Steven Spinner would manage an unassisted goal with just six seconds left in the game to help UNO leave Thursday night with a 6-4 win. The second game of the series on Friday night, however, turned out to be a little different for the Mavs. Notre Dame was the first to strike, Colin Theisen gave the Fighting Irish a 1-0 lead when he scored a goal just three minutes into the first period. They held a 1-0 lead for a few minutes throughout the period, but UNO’s Klehr answered back with a goal of his own with a little over eight minutes remaining in the period to tie it up at 1-1. UNO managed to get a power play opportunity late in the period, and scored another quick goal off the stick of Ryan Galt to make the score 2-1 before the end of the first. But it didn’t take long for Notre Dame to tie it up again, Colin Theisen scored his second goal of the night on a power play opportunity just 32 seconds into the second period. The Fighting Irish began to apply a lot of pressure during what would turn out to be a disastrous second period for the Mavs. Just four minutes into the period, Notre Dame quickly piled on two more goals from the likes of Cam Morrison and Jack Jenkins in a matter of 11 seconds to take a 4-2 lead. The Mavs struggled for a bit to get back in the game, but Pope added another goal to his stat sheet when he made the score 4-3 with seven-anda- half minutes remaining to play in the second period. With the momentum creeping back toward the Mavs, Notre Dame stole it all back with a heartbreaking goal just a minute and a half later off the stick of Jordan Gross. The second period would end with a score of 5-3 in favor of Notre Dame after their huge four-goal period. Notre Dame’s lead heading into the third period would prove to be enough, but not before UNO’s Galt made it interesting with about nine minutes remaining in the game when he scored to make it 5-4. The Fighting Irish held on though, and managed to avoid being swept at home with their 5-4 win over the Mavs on Friday night. The Mavericks are now 3-2-1 on the season and will return to Omaha where they will take a week off from playing. 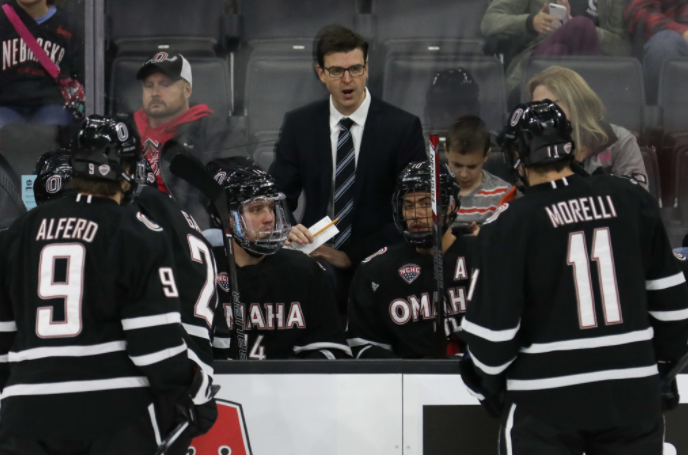 UNO then travels to Colorado Springs, Colorado on Nov. 10 and 11, where they will play their first conference series of the year against Colorado College.